Georgia Madden added this to How Do I... Clean My Air Conditioner Filters? Do the different types of air conditioners – split system, ducted and cassette – all have washable filters? Every type of air-conditioning unit has its own specific filter, and many units will have multiple filters. All filters are removable and most can be cleaned. It’s important to refer to the manufacturer’s instructions, as some filters will need replacing and cannot be cleaned. Georgia Madden added this to How Do I... Choose a Portable Air Conditioner? How do they work? Most portable air cons work by emitting cold, air-conditioned air through the front vents and expelling hot air outside through an exhaust hose connected to your window. You’ll usually need a window kit to set up the exhaust, which will generally come with your air con. Georgia Madden added this to How Do I... Choose the Right Neutral Carpet? What are the main colour options in neutral carpets?Beige: A light, easy-to-live-with neutral. It will make a room feel bright and open.Camel: A darker version of beige. Adds a cosy feel to a space.Grey: This on-trend neutral comes in various shades, ranging from pure grey (a blend of white and black), cool grey (which has a note of blue), to warm grey (which can have a brown, red or yellow base). Charcoal: A darker version of grey that is almost black and makes for a chic and dramatic scheme. Brown: A true, mid-tone brown can skew blue, green, yellow or red so be careful to choose the right brown to suit your existing colour scheme. Take carpet samples home and look at them beside your existing furnishings under different light conditions. 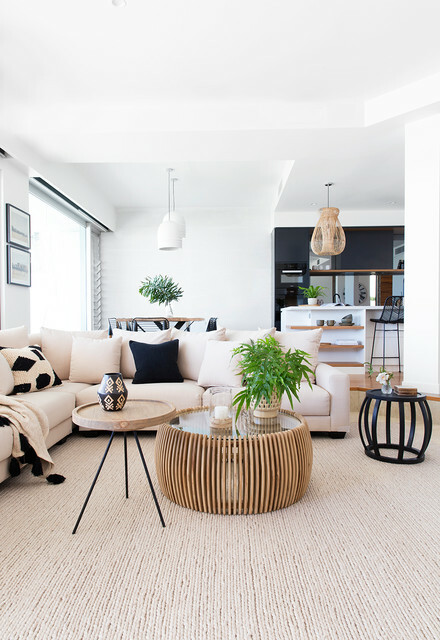 Living areaLocation: Gold Coast, QueenslandDesigner: Donna Guyler DesignFeatures: The eclectic coffee and side tables have us in a swoon.